On Monday, Los Angeles dedicated the Palms-Rancho Park library to the late Ray Bradbury. 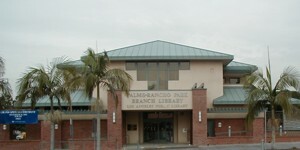 File 770 reported that while this is a newly remodeled and upgraded library, the original "was the one closest to Bradbury household. Ray would take his four daughters on adventures to this library."